Fred Stites of Kent County had the state’s top 2018 soybean yield with 78.81 bushels per acre of full season soybeans. The field was no-till and Stites used Pioneer P35T58 seed. Mark Collins of Sussex County won the statewide double crop competition with 67.98 bushels per acre. Collins planted Dekalb 4135 following corn, which had been cover cropped with rye. The contest was created by the Delaware Soybean Board to gather data on practices incorporated in producing high soybean yields while recognizing the individuals who have achieved such yields. The goal is for the information gathered in the contest to help increase yields for all farmers across the state. Full contest information and results summary can be found on the DSB website at desoybeans.org/yield-contest/. 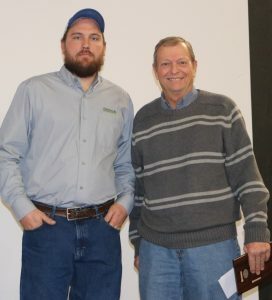 County winners for full season soybeans included Daniel Palmer of Kent County with 78.48 bushels per acre and Jesse Ellis of Sussex County with 68.70 bushels per acre. Winners at the county level for double crop beans included Joe Calhoun of Sussex County with 63.16 bushels per acre and Grier Stayton of Kent County with 61.73 bushels per acre. There were no entries completed in New Castle County this year. Atkins announced the awards during Agronomy Day at Delaware Ag Week in Harrington. The state top yield winners in full season and double crop categories received $1,000 and each of the county winners received $250.